The global models are predicting quite a change by the end of the week, with a strong 500 mb short wave digging into the western US. The 108-h forecast at 500 mb by the GFS is shown above, valid at 5 pm MST next Friday afternoon (October 4th). The 108-h 500 mb spaghetti plot from the GFS ensemble is shown below, with all members very similar over the western US and north Pacific. The ECMWF is also similar (forecast below is for 5 am MST Saturday morning), but a bit deeper and further south with the strong vorticity advection. The GFS is quite dry with system at this time, as only a member or two are forecasting precipitation at lower elevations. The ECMWF is perhaps a bit more moist. Regardless, a strong and dusty frontal passage likely Friday afternoon, with much cooler temperatures. Note that the ECMWF drops 500 mb heights over Tucson by more than 300 m from this morning to Saturday morning. So, increasingly interesting weather for the Southwest as the week progresses. What a game that was last night. Yesterday's strong front brought winds of 25 to 40 mph during the afternoon, along with more blowing dust. 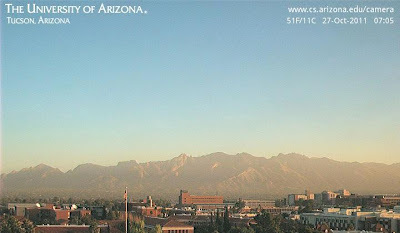 Lots of suspended dust still hanging in the sky this morning, as per above view of Catalinas shows. 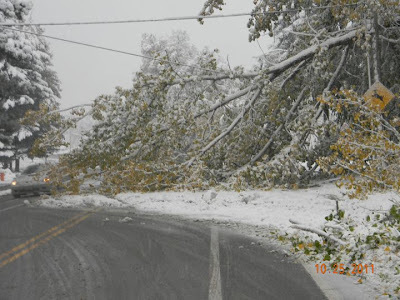 The Front Range snowstorm yesterday morning took down lots of limbs, since the leaves were still on the trees up there (see two photos below from Loveland). The trees then took out power lines, so quite a mess. My son reported the power was still out at his place in Loveland late afternoon yesterday. During the years we lived along the Colorado Front Range, it was quite amazing how many times the boys went trick-or-treating, bundled up in serious cold weather gear, crunching along in the snow. 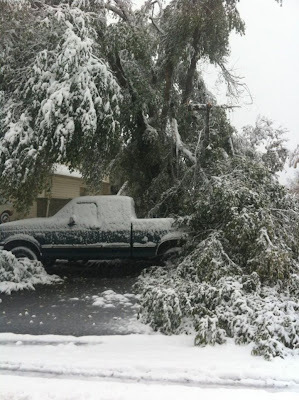 All of us in Charlie Chappell's group in Boulder called this the Halloween Snow Anomaly. 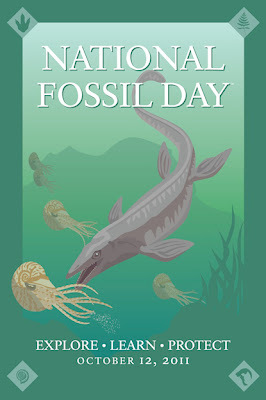 Looks like it came a few days early this year. 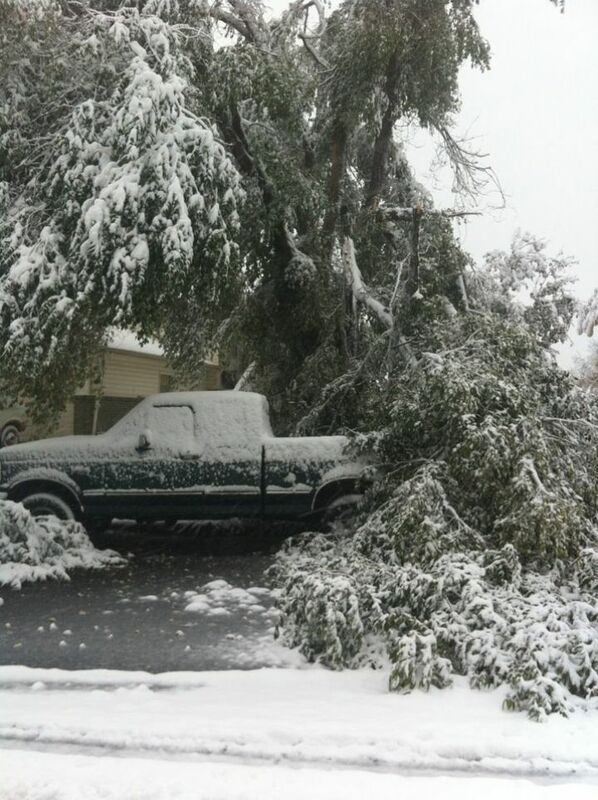 Photos below sent by a friend from Loveland this morning. There were some thunderstorms and light showers over parts of Cochise County yesterday afternoon. The morning run of the Atmo WRF-NAM forecast of radar echoes at 4 pm yesterday is shown above. 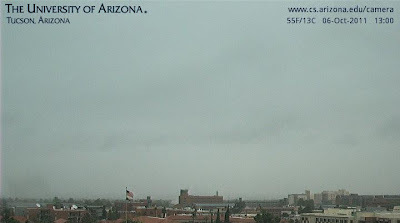 The light echoes around the Tucson area were mostly dry, but I did notice some virga off toward the Rincons around noon. The ALERT network had no measured rain at any site. The four southeastern-most RAWS stations in Arizona had light rainfall from the storms; all less than 0.10", except for 0.20" at Rucker. Douglas and Ft. Huachuca both reported thunderstorms, but just a trace of rainfall. The cloud-to-ground lightning strikes detected yesterday afternoon are shown below. The early WRF-GFS forecast today keeps showers this afternoon and tomorrow well off to the north and east. Hurricane Rina is a Cat.2 storm this morning and is located southeast of Yucatan - see 1345 UTC visible image below. The storm is forecast to strengthen to a moderate hurricane as it moves toward the Yucatan Straits. 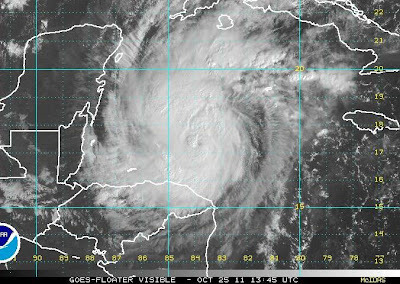 Eventually, NHC predicts an abrupt turn toward the east and western Cuba. At sunrise this morning there were some clouds in the distance from southeast to northwest, and even a few small buildups. Visible satellite image from 8 am MST is above. The early run of the Atmo WRF-GFS model actually forecasts a bit of convection this afternoon in Santa Cruz County. 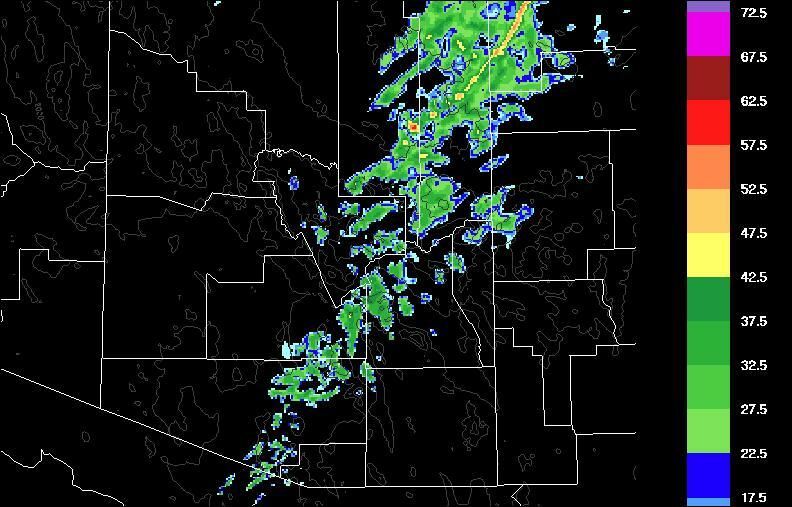 Image below is the model forecast of composite radar reflectivity at 3 pm MST this afternoon. First precipitation forecast by the model in many days. 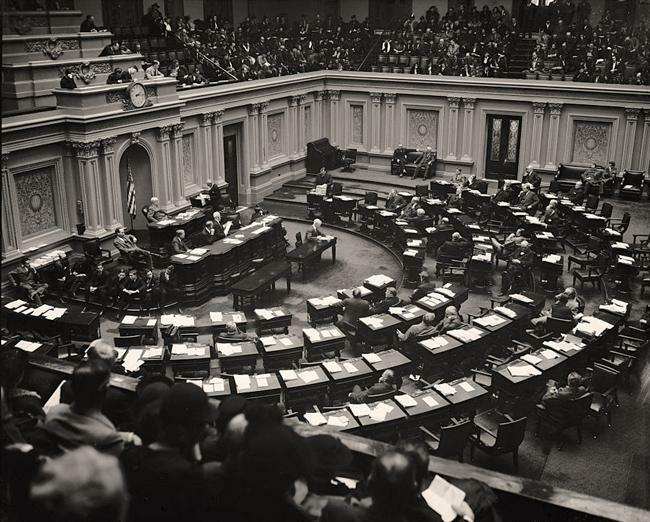 Jim asks a bit more: One more question, please: what inhibits the wind at your location when the airport is windy at night? 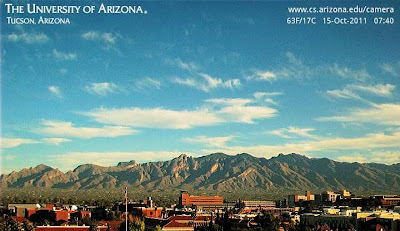 Does your proximity to the Catalinas have an effect? I've shown an expanded view of the area we're talking about above. The Rilltio Wash is the brown, sandy ribbon running east-west through the center of the photo. 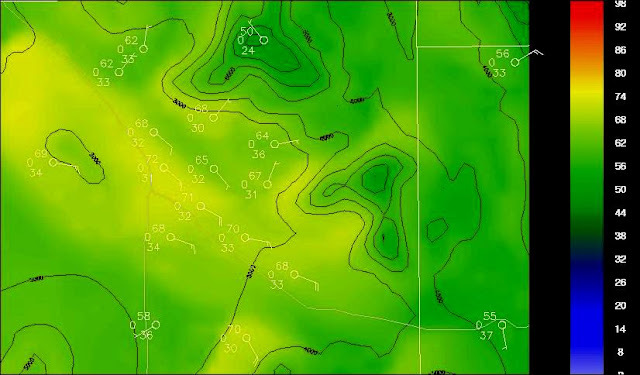 The lowest elevations in the photo are along the Wash. Basically, as cold air forms in the Wash, due to radiational cooling after the sun goes down it deepens into a stable pool of cold air within the Wash and immediate surroundings. Cold air is more dense (heavier) than the warmer, less dense, air above, which is where the winds are. The deeper the cold air gets, the more difficult it is for the winds in the warm air to mix down to the ground. So, the cold air in the wash can only drain slowly down the wash toward lower elevations due to gravity. Once the sun comes up, it rapidly heats away the cold pool. Often when I am walking just after sunrise, I observe the wind blowing in the upper limbs of very tall gum trees, while it is still perfectly calm and cool at the surface. The airport is a nearly flat, open location. As radiation cooling occurs there, the colder air continually drifts off toward lower elevations, frequently allowing mixing to bring warm and windy air to the surface. 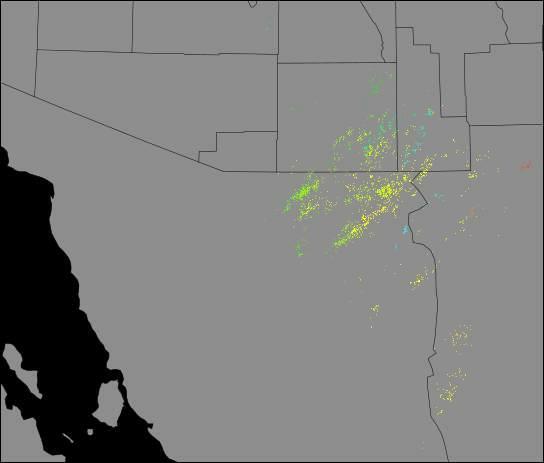 The Catalinas do not play a direct role in any of this, since surface winds here tend to be from either the northwest or southeast. Satellite image from this afternoon - where have all the clouds gone? What caused the 16 degree difference between your house and airport? 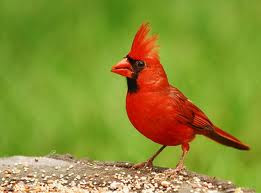 Are you wind-sheltered? Amazing there could be up to a 26 degree difference between the airport and the bottom of Rillito Wash! My answers - First, our back yard is not wind-sheltered by obstacles. My max/min thermometer is situated in a "desert" area - rocks and sand, native vegatation, no watered yard anywhere nearby, and is at a height of only 4 ft above the surface. The largest differences in minimum temperatures between here at house and TUS have been 20-25F. Note that maximum temperatures are not much different. Lowest temperature I've measured here during past 13 winters has been 9F. 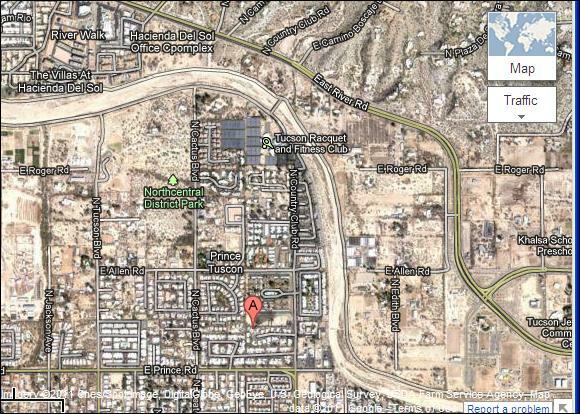 The map below shows our location ("A") - note that it's pretty "brown" in this whole area. The wash is only about a long city block directly to the east of the house. 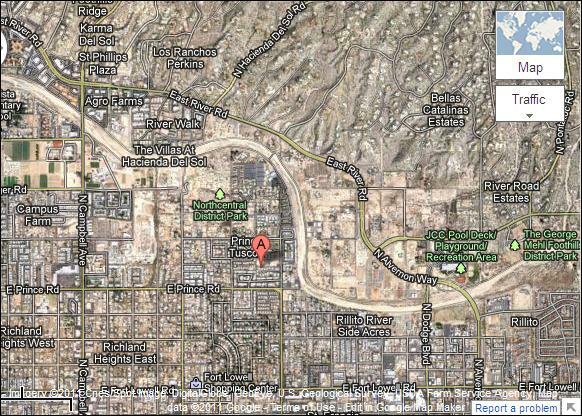 Second - the difference in elevation between TUS and the Rillito Wash is about 300 ft msl. Our backyard is probably 30 to 40 feet higher than the wash where it crosses under the Campbell Avenue bridge. So, the wash is often considerably colder at sunrise than here at the house. The airport location is prone to wind during the night, so nocturnal mixing often keeps temperatures quite warm down there, relative to many other locations witin the City (we are within the Tucson city limits here). Third, cold air drainage into the Rillito Wash is very substantial, as is very effective local radiation within and near the wash. Low specific heat surfaces dominate down there. The terrain gradient just on the north side of the wash is substantial between the wash and Ina/Sunrise. So cold air that develops during the early night seeps down the smaller washers into the Rillito. Cold air develops quickly enough on clear, dry nights to effectively provide a stable cushion of cold air that often keeps the wash calm all night. So, low temperatures up here near the wash are usually cooler than those at TUS, regardless of time of year. The really big differences occur on nights with strong radiational cooling and enough synoptic pressure gradient to keep winds blowing some during the night at TUS. Was an interesting walk this morning. It was cool here at the house (low temperature of 48F), but it was distinctly colder right down in the Rillito Wash - I'd estimate about 10F colder. However, as I walked toward the east (upstream), I encountered pockets of both warm and cool air drifting along down the wash. The 1200 UTC 850 mb chart (above) shows that the central US front did back into southeast Arizona. Winds this morning at the airport and DM AFB have gusted from the east-southeast at 20 to 30 mph. 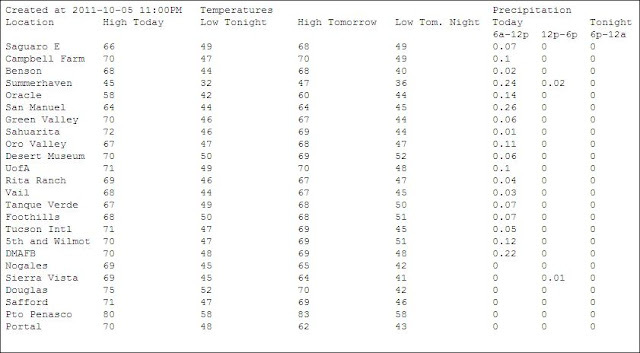 The east winds (which were well-forecast by Atmo's WRF-GFS model, both yesterday and in the early run this morning - forecast valid at 5 am MST shown below) kept the "official" low temperature quite mild - looks like it was probably 64F at airport; 16F warmer than here near the Rillito. The 850 mb plot also shows that the cold front pushed south across the Gulf of Mexico. It is hard to know if strong winds have blown out into the Gulf of Tehuantepec - perhaps satellite loops will give some indications later today? A couple of things are of interest this morning - with one that will affect southeastern Arizona. As a 500 mb trough to our north (vorticity maxima over the Uinta Mountains early this morning) digs to the southeast over the next 48-hours, several things attend the deepening system. First, a strong, surface, cold front is advancing down the Front Range of the Rockies. This front (see 1800 UTC surface plot above) already extends into extreme northeastern New Mexico. It should be affecting Tucson, as a backdoor front from the east, around sunrise tomorrow (see this morning's NAM 850 mb forecast valid at 1200 UTC tomorrow morning - below). The NAM model forecasts the backdoor portion of front to be even more pronounced on Wednesday morning, as serious amplification of the 500 mb trough occurs over the central U.S. The deepening system over the central U.S. extends into the Gulf of Mexico on Wednesday morning, after kicking out the large area of disturbed tropical weather currently near Yucatan - a threat of heavy rains over the Southeast and Florida as this happens later today and tomorrow. The strong, surface, cold front is forecast to push southward all the way across the GoM. 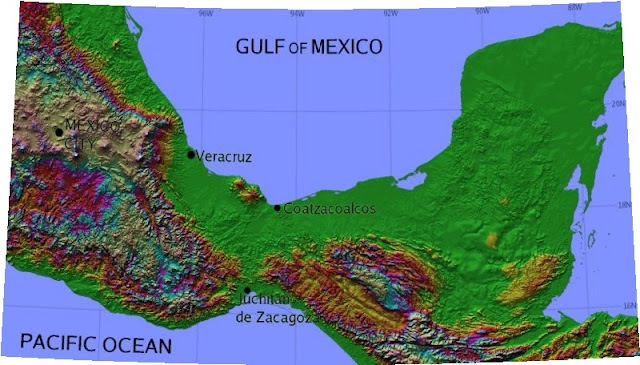 Although it is early in the cool season for this to happen, the model forecasts indicate that cool air will push southwestward, crossing the Isthmus of Tehuantepec (see map above) by 48-hours. 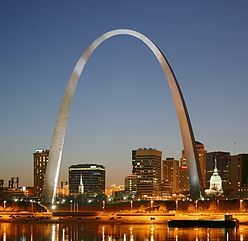 The land bridge of this isthmus reaches an elevation of only 735 ft. When continental cold fronts push this far south, the cold air funnels through the terrain gap, producing strong northeasterly winds out into the Pacific - these can be a serious hazard to fishermen and sailors. The 48-hour forecast from the GFS model (below valid at 1200 UTC 19 October) indicates such an event is imminent. Cold fronts such as this can also produce strong wind events in the Vera Cruz region, as cool, stable air is trapped and forced around the east end of the high mountains to the north-northwest. Cirrus cloud has wafted in from the Pacific this morning (see above image) - making this the biggest weather day of the past week. 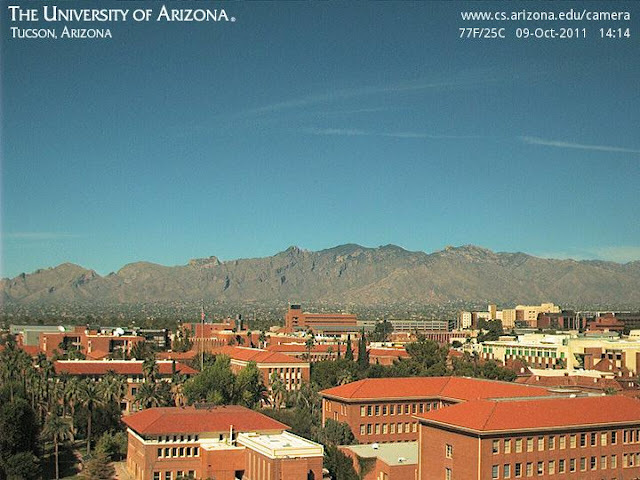 I reviewed the hourly, web cam, images from the Computer Science building and did not see a cloud since last Sunday afternoon! 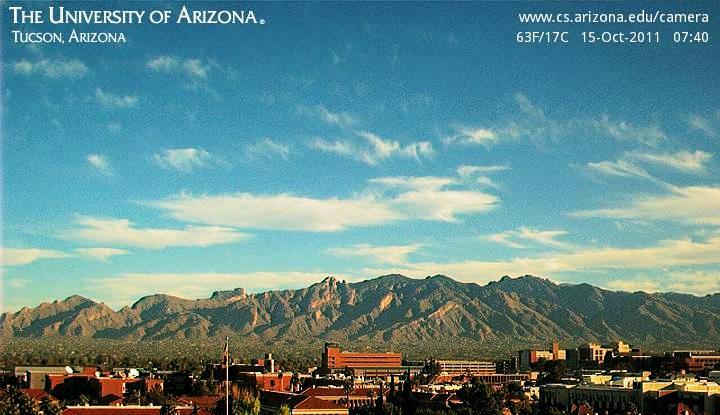 There is also some slight chance that Tucson will hit 100F today at the airport. If it did, it would mean a diurnal swing of more than 50F here at house, since we started with a low of 49F. So, that's the big weather news from southeast Arizona. Today will be busy downtown, since this is "Tucson Meet Yourself" weekend - a multicultural festival started back in 1974 by Big Jim Griffith, our local folklorist - see http://www.tucsonmeetyourself.org/about-2/staff-and-board/dr-james-big-jim-griffith/ Food, entertainment, an Iron Chef competition, a low-rider car show, other special events, and lots of sunshine. Hats and sunscreen mandatory. Down to the far south, TS Irwin (IR image from this morning above) has become somewhat of an oldster - he has been wandering around the eastern Pacific for 10 days now - sometimes weakening and then resurging. How long will he last? 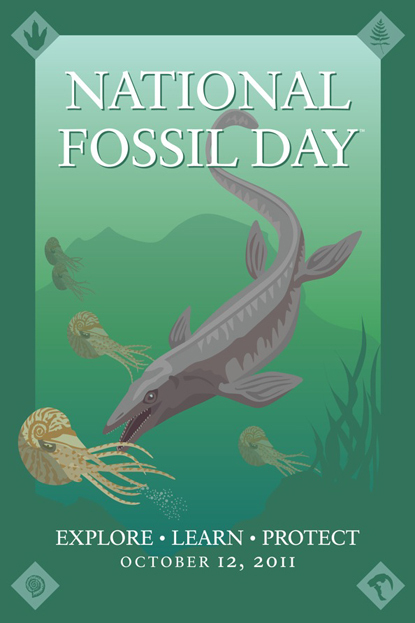 Join the National Park Service, the Smithsonian National Museum of Natural History, and other National Fossil Day partners for a day of fun in the Senate Gallery observing fossils in action! Bring your shovels. Very nice Fall weather continues here in Tucson, with cool mornings and very low RH. Spectacular, just past full, moon set in the west this morning. Looks like hot afternoons are returning. 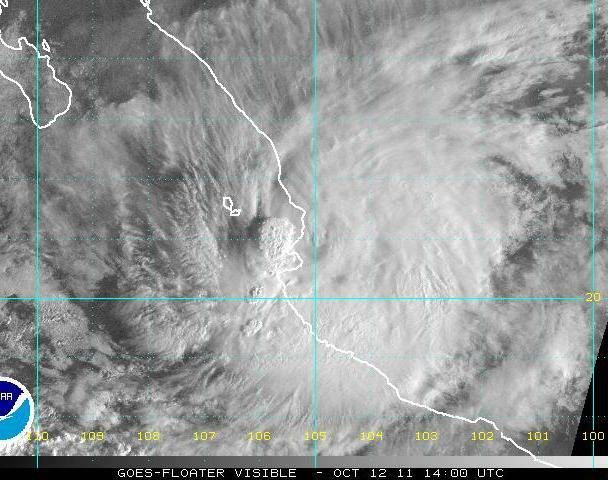 Hurricane Jova came ashore last night as a category 2 hurricane, making lanfall somewhere just south of Cabo Corrientes. This morning the storm is inland (visible image from 1400 UTC this morning is above) over the mountains northeast of Puerto Vallarta (see map below). Jova is weakening rapidly, but will move slowly northward, continuing the threat of floods and landslides. Hurricane Jova strengthened to a Cat 3 hurricane early this morning (visible image at 1500 UTC is above). 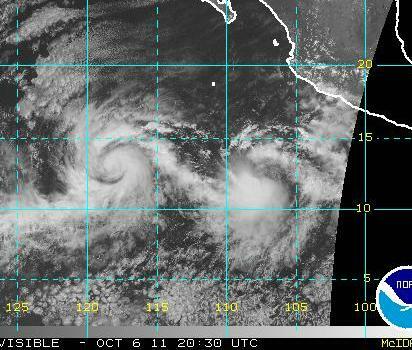 Thus, Jova is the fifth major hurricane in the Eastern Pacific this season. 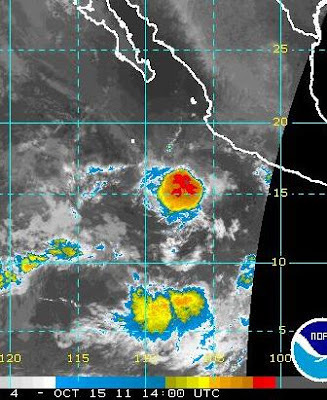 Jova appears headed toward the coast of Mexico (see current NHC forecast below). TS Irwin is currently a bit unorganized and is also tracking toward the east. The long-range global models have varying solutions regarding the evolution of the remnants of these tropical storms - so there's a bit to watch far to our south. Chamber of Commerce weather has prevailed this weekend, with nearly cloudless skies, mild temperatures and light breezes. The morning lows here at house have been quite chilly with 35F on Saturday and 37F today (this in contrast to official lows at the airport of (45F and 48F). A comparison with fall 2010 shows that the first low in the 30sF here at house did not occur until November 10th - thus, off to a cooler start this Fall. Yesterday's cold front and bands of light showers produced dramatic temperature changes, but only small amounts of rainfall. Above is view toward Catalinas at 1 pm MST yesterday afternoon. Below is time series of T and Td at Atmo, showing the big temperature drop around 11 am. Here at the house the temperature was hanging around 52 to 55F from noon to early afternoon. This morning's low was 44F (lowest Fall temperature before this morning was 56F on several days). Rainfall here was only a trace. Across the ALERT network 24 of 93 sites had rainfall (~25% areal coverage), but amounts were generally light, except in the Catalinas where 1 site had more than half an inch. Rainfall was generally restricted to the northwest part of the network and the Catalinas. This morning significant cloudiness and moist air below 700 mb remains present over eastern Arizona - as can be seen in 1415 UTC visible satellite image above. The 500 mb trough axis remains west of Tucson this morning, with a significant vorticity maximum located over the Yuma area. The maximum will move across southern Arizona today, and also bring cooling in the middle levels. The 500 mb NAM forecast from this morning (below) indicates that the vorticity maximum will be centered north of Tucson at 5 pm MST this evening. So, the question for today is whether the strong forcing for vertical motion will squeeze out some showers before the moisture shifts away from Pima County. Both the NAM and early Atmo WRF-GFS indicate isolated showers today, but mostly east and north of Tucson. The NHC identified the two tropical systems (mentioned in an earlier post) as TDs late last evening and early this morning. 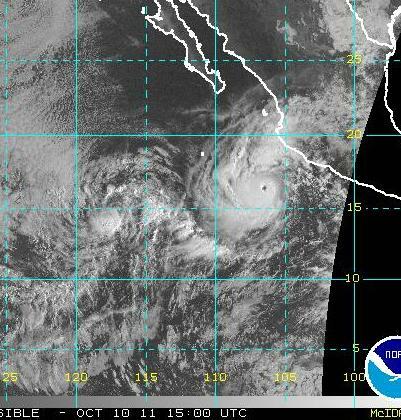 They were quickly upgraded to Tropical Storms Irwin and Jova (see above). The visible image below is from 2030 UTC this afternoon - it seems to indicate that there may be interesting interactions between the two storms. 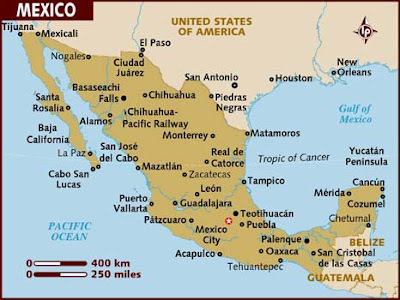 They are both forecast to become hurricanes; head abruptly toward the north and east; and both make landfall near Cabo Corrientes (i.e., on the Mexican coast near 20 degrees N). This morning's sounding at Tucson (above) indicates that warm, middle-level air is coming around the bottom of the Pacific cutoff - this is limiting instability and clouds to the lower half of the troposphere. There appears to be even warmer air upstream. Southern Arizona lies to the right side(warm side) of a powerful 140 kt jetstream that is over northern Arizona. I've just looked at the early run of Atmo's WRF-GFS model, and it forecasts that a band of showers will come across the Tucson area this morning (above is model forecast of composite radar echoes at 9 am). Note that the echoes are not intense, because of the warm air aloft and limited instability. The above table shows the WRF-GFS forecast for southeastern Arizona locations. The model forecasts today's event to be basically ended wrt precipitation by around noon. Note the very cool temperatures forecast for today and tomorrrow. The model is probably a bit too fast, but its indications of a fast hitting event are probably on track. 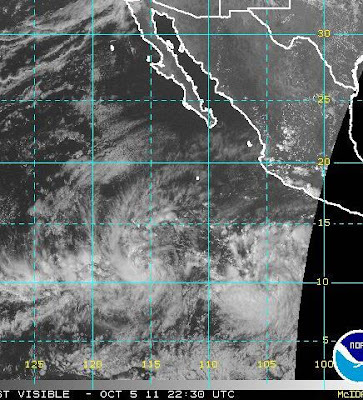 Two New Tropical Systems In Eastern Pacific? The NHC has identified two areas (above) in the eastern Pacific as having potential for developing into tropical systems. However, these systems are spinning away quite vigorously, as per satellite loops and it is likely that two TDs or TSs are currently present. 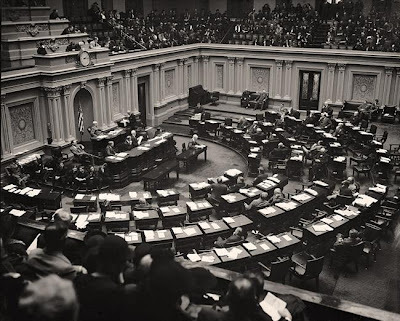 See the visible and WV images from this afternoon below. The next short wave at 500 mb is digging down the west coast and will cutoff over the Great Basin during the next 24-hours. 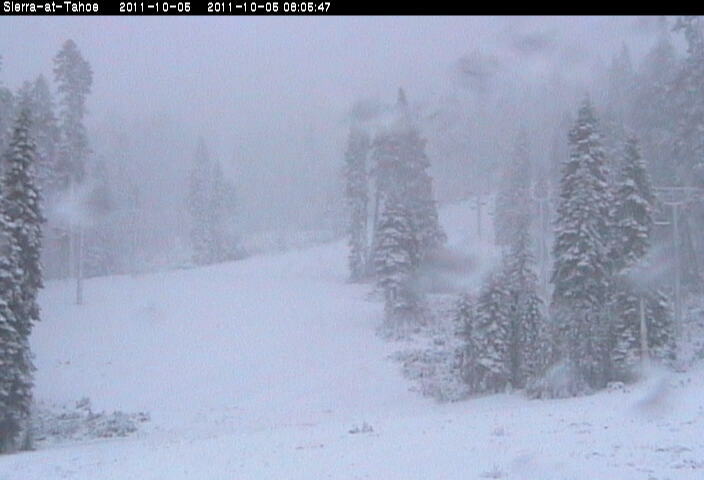 The above image is from a web cam near Lake Tahoe this morning - snow is flying in the high Sierra Nevada. The surface plot below shows that by 8 am MST this morning the precipitation shield had reached south into the LA Basin. - note the snow reported at the Lake Tahoe Airport. Above is this morning's NAM forecast for 500 mb valid at noon tomorrow (1800 UTC Thursday October 6). The strong vorticity band with the cutoff extends across northern Arizona. The correspondng NAM forecast of precipitation, surface pressue, and 1000-500 mb thickness is shown below. 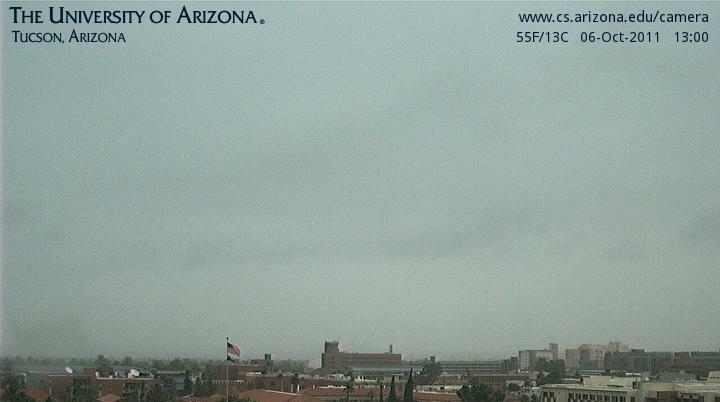 A band of showers is forecast to be approaching the Tucson area by noon tomorrow. 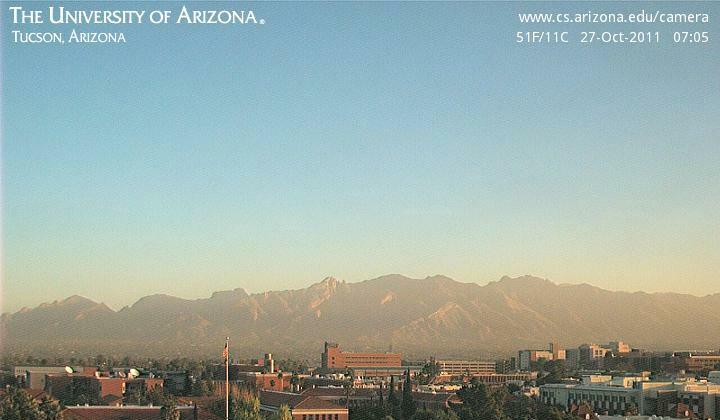 Given the sparse rainfall in south central Arizona yesterday, conditions remain favorable for blowing dust. Note that the thickness pattern indicates that the primary surface front is far to the east (i.e., yesterday's front) and that the showers are along a secondary front, but one with the thickness gradient packed very tightly. So, another interesting weather day on tap tomorrow. 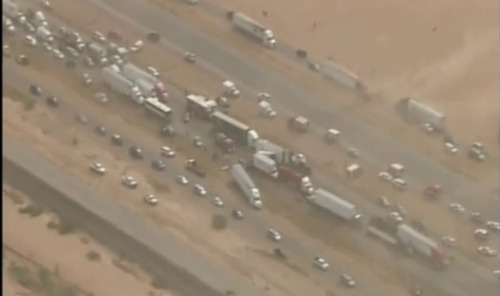 Disaster yesterday afternoon when blowing dust led to three different, multi-vehicle wrecks on I-10 between Phoenix and Tucson. There was at least one fatality and numerous injuries, as the crashes shut down the Interstate. The short wave and front crossing the state were strong enough to generate the dust storm, as winds gusted 30 to 50+ mph.. At top is aerial view of one of the wrecks and at bottom is view of the dust-filled boundary layer north of Kitt Peak at 3 pm MST yesterday.